Every year, right around Thanksgiving I put together a Hot Chocolate Bar. Which means we have everything we need to make one amazing cup of hot chocolate right at our fingertips. This year I decided to add a little something extra and make Hot Chocolate Spoons. 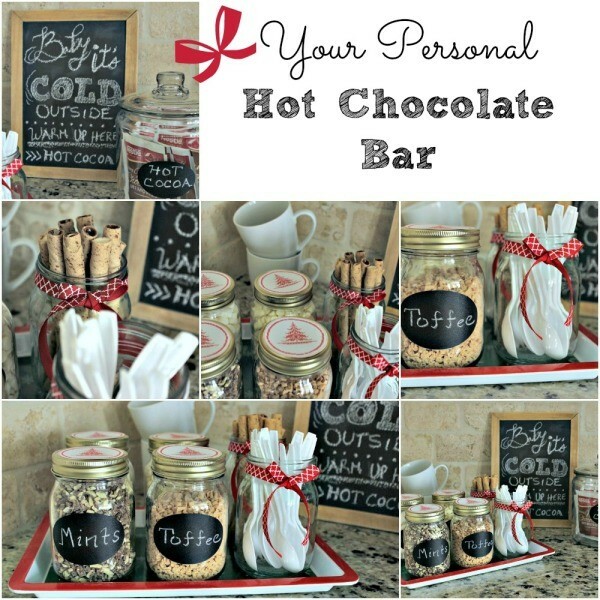 You can read all about how I set up this Hot Chocolate Bar over at Parties365. It was super easy and my kids and their friends love it. All you need are some containers, some toppings, a festive tray and a few personal touches like a chalkboard drawing and labels. 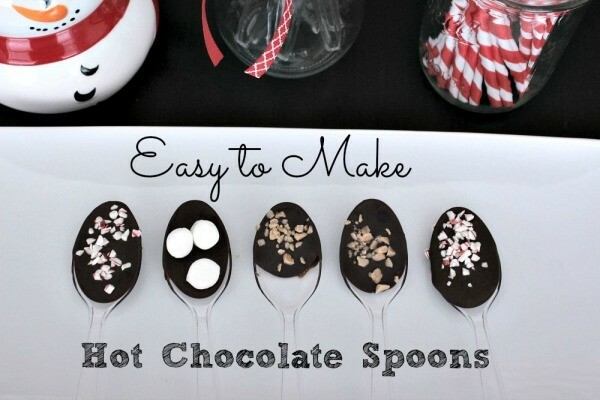 The Hot Chocolate Spoons were really easy to make and fun to use of course! All you need to do is melt some caramel squares for the caramel spoons and some baking chocolate squares for the chocolate spoons. I used Baker’s Semi-Sweet Baking Chocolate and it was the perfect amount of sweetness. After you’ve melted the caramel or chocolate, dip your spoon in to coat it. Lay it on wax paper and sprinkle your topping of choice on before it hardens. Do the spoons one at a time: dip in coating, sprinkle with topping, dip in coating, sprinkle with topping and so on until you’ve used all of your ingredients. The caramel hardens almost immediately and sets up very quickly. The baking chocolate takes about an hour to harden and set up. I made salted caramel spoons and used sea salt to sprinkle on each spoon. These are my favorite! That added caramel and salt touch to a cup of hot cocoa really makes it special. 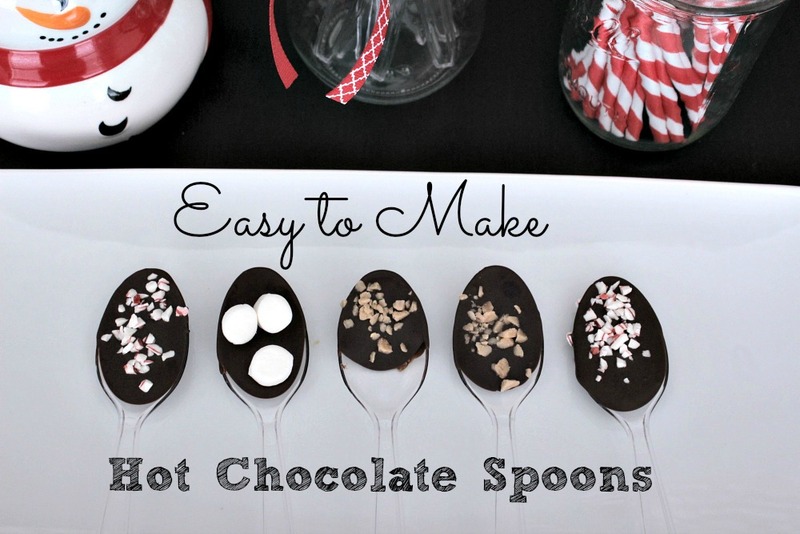 For the chocolate spoons, I used crushed peppermint, toffee bits and mini marshmallows. As you stir your hot chocolate, the caramel or chocolate and the toppings slowly melt into your cup. It’s magical. These would also perfect to give as gifts. 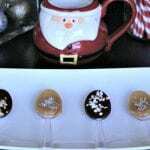 You could make a Hot Chocolate Basket and include all of the ingredients for a Hot Chocolate Bar, plus the Hot Chocolate Spoons. Add in some cute mugs and you have one very fun and thoughtful gift. I will definitely be making these every year and including them in our Hot Chocolate Bar set up. 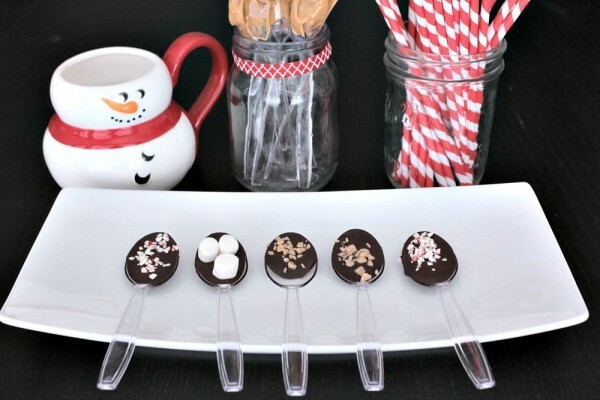 Hot Chocolate Spoons add a delicious touch to your hot chocolate. Just stir your hot chocolate and let the toppings melt into your cup. 1. In a microwave safe container, melt either the caramel or the baking chocolate. You want to melt and use one coating at a time. Melt in the microwave in 30 second intervals, stirring after each time. It should take about 1 1/2 to 2 minutes to melt. 2. Dip your spoon (either plastic or small wooden spoons) into the coating, making sure you're coating the front and back of the spoon. 3. Lay the spoon on wax paper and immediately sprinkle your topping of choice on the spoon. 4. 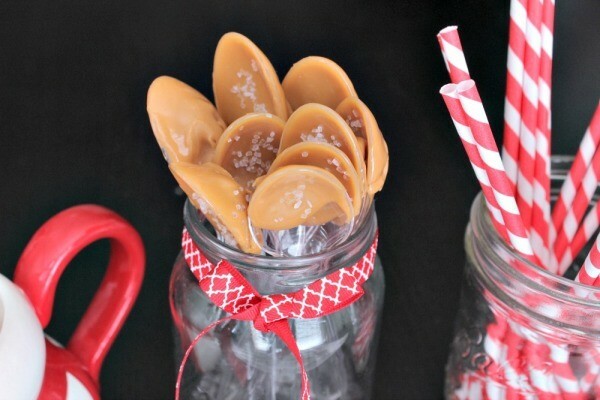 Do the same with the remaining spoons, or until your caramel or chocolate is all gone. 5. Let set up and harden. 6. Make yourself a cup of hot cocoa and enjoy! If you decide to give these as gifts, look for the small wooden spoons at your local party store or purchase online. 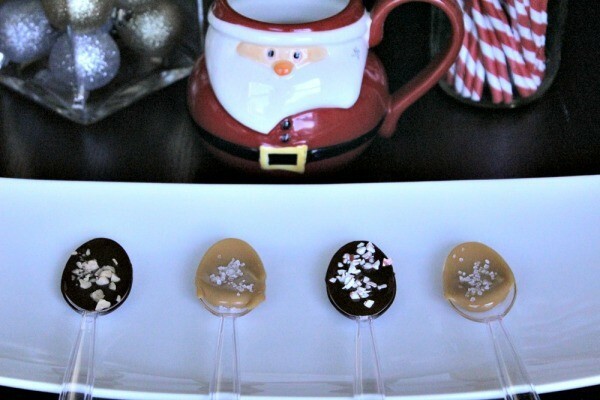 The wooden spoons really kick the hot chocolate spoons up a notch and they look so pretty.